Very many English learners from countries across the world find the process of learning English online difficult and confusing. It is easy to watch an occasional lesson on youtube or Facebook, listen to a podcast or learn an interesting fact on Instagram but then they have to put everything together the best way they can. In many cases this can leave large spaces in their learning. If learners ignore this, it could mean they lose great opportunities at job interviews and other situations or it can affect progress with their other studies. We have created full online English courses in line with IELTS and Cambridge English standards that can be taken online in a natural, logical order. In addition, all lessons are followed by mini tests and other support that helps cement learning. With the help of some great technology and an amazing team of teachers we offer the nearest thing to personalized tuition and it is completely free. These are the essential building blocks for your learning and are designed to give you a solid foundation in English. They comprise 60 lessons per courses carefully designed to form complete, structured courses -all created and presented by highly qualified and experienced English teachers. We are currently offering 5 levels for adults (from A1- C1) and this summer we will be offering a Foundation Course especially designed for younger learners. We are the only quality provider to offer these courses for free. Why give away all this content for free? Simple. We are passionate about what we do and we want to help as many students as possible not only learn English, but learn perfectly. Learning English is something that has benefits for a huge number of people and can make a significant difference to their lives. We also like to do things differently. That’s why we use real, highly qualified and very experienced teachers to present the lessons to you in the most personal way possible. We believe that our site is intuitive and just like all our lessons, the English we use is carefully chosen to be natural and forms an important part of your language learning experience. When you come to our site your English learning and practice starts immediately. And what’s more we offer free Live practice sessions on Facebook to support your learning from the lessons. Each week we offer one practice session for every 2 lessons of each course. Go to our Facebook Page to see the lesson schedule so you don’t miss a single practice session. Simply sign up and immediately you can start to work your way through a course, lessons by lesson with your progress recorded so you can continue from where you left it. Not only this, but you can view the lessons anytime and on any device (and change course if you want to). Yes. Totally. No payment details needed. All you need is an email account. It is as simple as this. 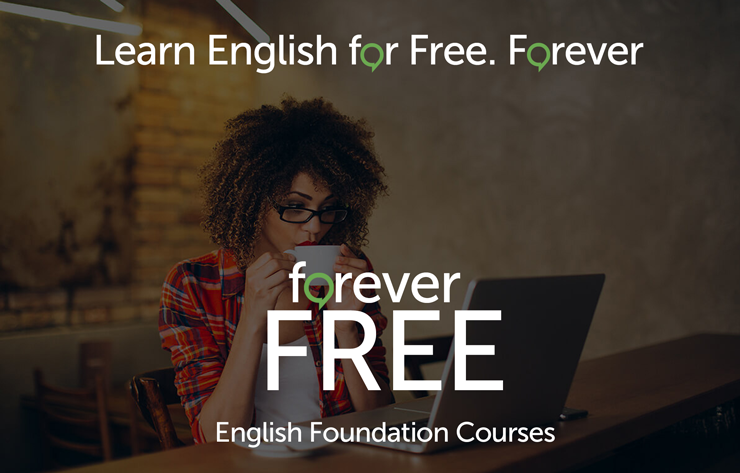 If you would like to learn English in a new way; a better way and a way that is free forever then sign up today. And tell your friends. The more students we have the more free lessons and practice sessions we can offer.